The noPhone highlights how attached people are to their smartphones. All the comforts and tactile satisfactions of a real phone. If you sleep with your smartphone under your pillow or find yourself reaching for it even when you know the battery is dead, you may have smartphone separation anxiety. The first step is admitting you have a problem. The second step might be getting a noPhone. 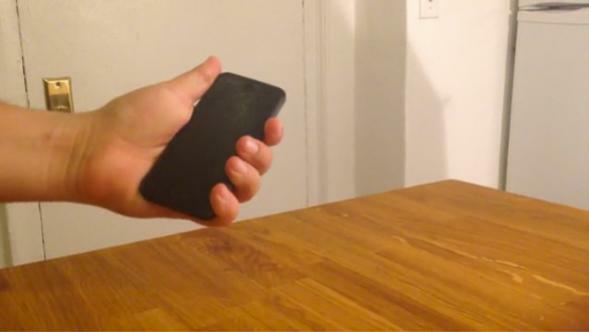 According to the gadget’s website, “The noPhone simulates the exact weight and dimensions of your most beloved gadget in order to alleviate any feelings of inadequacy generated by the absence of a real smartphone.” Like a stuffed animal or security blanket, it giving you something to hold when you feel anxious and disconnected. As the site explains, the noPhone has superior features to a normal smartphone, because it’s totally wireless, battery-free, doesn’t require software updates, and is shatterproof and waterproof. These are features that real smartphones need. Q: Does it have a camera? Q: Is it Bluetooth compatible? Q: Does it make calls? Q: Is it toilet bowl resistant? The noPhone site design and branding makes it seem like a typical tech product, which is why it’s so effective at conveying its message: Put your phones down, people.